Unique evaporative surface resists mineral build-up - performance not affected by hard water problems. The Desert Spring uses an assembly of more than 40 textured plastic discs, and therefore has no sponges or drum pads to become fouled or to replace. Resists bacteria and mold growth - maintains humidity output throughout service life regardless of mineral content of water so water cannot stagnate and create a breeding ground for bacteria and molds. 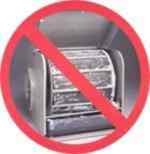 No parts to replace - competitor's models require replacement media (sponges/pads/filter screens) at least annually, and sometimes monthly! These replacement parts make competitor's models more expensive over their service life. Convenient drain located on the bottom of the unit makes the annual cleaning a snap! Complete package - the Desert Spring furnace humidifier comes with everything you need to install it and use it efficiently, including a humidistat! - you won't have to purchase any additional parts. Built to last - The Desert Spring is composed of high quality components. All plastic molding in done in North America. The Desert Spring is fabricated with modern, high quality non-corrosive materials. You won't find cheap flimsy plastics or corrosion-prone metal water reservoirs here. All parts are of top notch quality and backed by a comprehensive warranty. The unit's balanced design eliminates stress on the high torque motor, providing years of trouble-free operation. Very energy efficient - The humidifier consumes only 4 watts of power when in operation! Compare that to fan-driven console humidifiers, steam, or ultrasonic humidifiers! Moreover, keeping your home in the optimal humidity range will enable you to reduce your thermostat temperature setting in your home by an average of 2 or 3 degrees F and it will still feel just as warm. The result? You save on your energy bill! Compact size - allows quick, easy installation on almost all forced air furnaces and heat pumps. Can be used as a replacement to an existing humidifier or as a new installation. Unequalled accessory packages - want a self-cleaning, ultra low maintenance system? Consider adding the Desert Spring AutoFlush and /or our unique scale inhibiting humidifier water filter to your unit. These accessories are available exclusively for the Desert Spring furnace humidifier and are ideal for hard water environments. * When equipped with the AutoFlush accessory, a few gallons per day will be washed down the drain during the pre-set self-cleaning cycles. This is still a tiny fraction of the water used (wasted) by flow-through style models (59 gallons per day according to the independent testing. Tests assumed a 17 week heating season with a call for heat 50% of the time.